a run down the left wing. with the Port fans lookin on. After 4 Super League matches Port went into this game looking for their first win, Oakley United were the visitors to the Canniepairt. On their last visit Oakley left in jubilation after surviving the drop from the ESL when they recorded a 0-1 success. They must have been hopeful of another good result but Port had other ideas. Tayport having been unfortunate in their previous matches this season started the match strongly with great enthusiasm and some fine efforts on the Oakley goal. In the early exchanges it was Oakley who missed the best opportunity with their number 7 sending a shot wide to the right from close range. 2 minute later it was Gareth Dailly clearing another Oakley effort. Tayport got into gear and on the 15 minute mark it was the new signings of Sean Christie and Ben Honeyman who broke with Christie down the left wing and Honeyman straight down the middle. An inch perfect cross and Ben connected to send the ball past the approaching keeper from 12 yards. 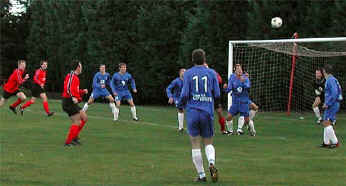 Next was a Gareth Dailly free kick from 25 yards out. Gareth sent his effort to the left of the wall and bending upwards looking for the left hand corner but it shaved the crossbar. 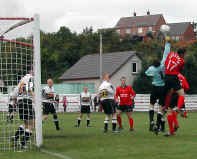 Next up was Derek Wemyss header saved by the keeper. At the other end Oakley were given an opportunity after Frazer Fitzpatrick went for a quick throwout with the ball landing at an opponents feet. the ball was quickly returned from the left but another Oakley chance was lost. 40 minute mark and the Port dugout was on their feet after a strong claim for a penalty/free kick (it was on the line) after a poor challenge on Ben Honeyman. Are linesman allowed to wear glasses?????????. Port looked good in those final 30 minutes of the first period but much more was to come. The second half got under way and immediately Oakley were under attack (remind you of something?) 46 minutes and Port had a corner from the right. The tall Brian Craik was prowling on the 6 yard line when the ball was sent over. The Oakley keeper must have thought his defenders had him covered but Birdie was well up in the air while the keeper was rooted on the goal line. 2-0 and you could feel the confidence coming back on the park just what the gaffer ordered. Next a through ball to Barry McNaughton found the Oakley keeper quickly out and diving at Mcnaughton's feet for a fine save. Next up Sean Christie with a great driving effort from 25 yards with the keeper stretched and the ball scraping the paint of the crossbar. As for the first goal the same combination came up trumphs again. A finely measured pass from Sean Christie sent Ben Honeyman through the middle to take the ball around the diving keeper for goal number three. 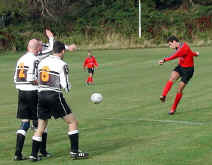 Oakley responded with a good 25 yard effort which had Fitzpatrick diving to his right to send it for a corner. 80th minute and Brian Craik tried to get on the scoresheet again with a 20yard shot which went inches over. Grant Paterson was replaced by John Elliot and a further 2 changes saw Goal scores Ben Honeyman and Brian Craik being replaced by Kevin Heenan and Steven Stewart. Substitute John Elliot soon found himself with an opportunity to grab a goal but his goal bound effort was sent packing with a great diving effort from the Oakley keeper (Potter) The closing stages of the match saw some good balls coming from the left from Kevin Heenan and Gareth Dailly. Oakley who came into this match undefeated will be disappointed they did not grab the early chances they had. Tayport showed great spirit and hopefully this display will set them up for the season ahead. Well done lads, great effort. UPDATE - Defender Grant Buist will be out for at least six weeks after breaking his hand against Oakley on Grant had fallen awkwardly on Saturday but shrugged it off as a stave. However the pain remained and the extent of the injury was only revealed Tuesday night after physio Norrie Marshall suspected all was not well and suggested Grant visit hospital. B Honeyman - S Christie Subs used - K Heenan - J Elliot - S Stewart. Kevin Heenan on another run. Gareth Dailly leaves them lying down. Tayport headed North today for a first round match with Brechin Victoria in the NCR Cup. Port playing down the steep slope were soon in control across the midfield. 10 minutes and Port were awarded a free kick 30yds out on the right. Up stepped Gareth Dailly who sent the ball bending around the two man wall and leaving the goalkeeper stranded only to be denied the opener by the right hand upright. Port continued to take control with Gareth Dailly relishing in a midfield roll spreading the ball from right to left. On the 26th minute mark Port got the breakthrough that was on the cards. A Steven Stewart corner on the left was sent straight to John Elliot who sent a first time volley high into the right corner from 23 yards. 2 minutes later a Kevin Heenan piercing run down the right with Kevin cutting inside to send in a searching cross which was intercepted by a sliding Vic defender who deflected the ball into the near corner of the net. Tayport continued to press the Brechin goal with the best of the remaining first half chances falling to Sean Christie who was closed down quickly by the Vics defence. Tayport opened the second period in similar fashion to their previous matches this season with some strong pressure. 57 minute and a John Elliot penalty had Port 3-0 ahead, 64 Minutes and Kevin Heenen sent in a cracking right foot shot from 20 yards high into net. Port continued to control the match with Frazer Fitzpatrick rarely tested. Ralph Hunter and Brian Craik came on for Ben Honeyman and Sean Christie. Port headed South for this Whyte and Mackey East Super League match with League leaders Arniston Rangers. A crowd of 254 watched Tayport grab the opener in 8 minutes when Steven Stewart sent Sean Christie through to brush aside a Scott Nisbet challenge and slam the ball low past the Arniston keeper. Arniston looked dangerous from set pieces and corners while Port continued to play some good football in the first period. 2 minutes into first half injury time Arniston got the equiliser. 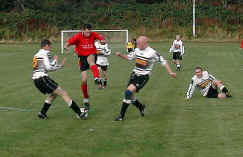 Coming after a series of corners John Ward was put under pressure by the Rangers attack and headed the ball past Frazer Fitzpatrick for an OG. Arniston had the better of the second period with Port not really threatening. In 55 minutes Barnes and McDonough set up a chance for Malone to put Arniston ahead. Malone turned away to celebrate but John Ward came from nowhere to make a dramatic last ditch clearance. 65 minutes and Pryde blasted past an open goal from 10 yards then in 72 minutes Port keeper Frazer Fitzpatrik made a superb block as sub Nicol looked set to put the home team in front. In the dying minutes of the match Kevin Heenan put Ralph Hunter down the right, Port's tall striker did well to send over a searching cross, Rangers keeper Bennet had it covered and punched the ball clear. 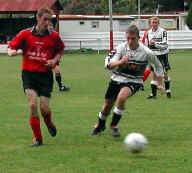 With some persistence Derek Wemyss won the ball back for Port and sent it out to Sean Christie on the left. A brilliant cross from Sean found the head of of the tall Brian Craik who sent the ball goalbound from a couple of yards. One yellow card in the game - Nisbet for a foul on Sean Christie. Tayport welcomed local Taysiders Lochee United to the Cainniepairt for this Whyte and Mackay East Super League encounter. Equal to Port Lochee started their Super League slowly, recently they have put in some good performances against Bonnyrigg and early pacesetters Kelty Hearts. Today's encounter opened with Port looking like they would take control of midfield. On 7 minutes Brain Craik had the best opportunity on offer after a John Ward header across goal from a free kick. Nine minutes into the first period and Lochee started to take control of the middle winning most high balls and setting up some long range efforts. Twenty minutes and Lochee broke through the middle. Last man John Ward made the challenge on the edge of the area. 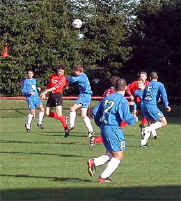 Referee Marshaley made the decision it was inside the area and pointed to the penalty spot which was hotlay disputed by the Port players. Having been the last man John Ward was shown the Red Card. 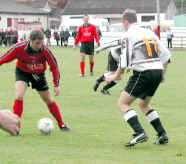 Jon Thompson stepped up to neatly slot the ball past Frazer Fitzpatrick. 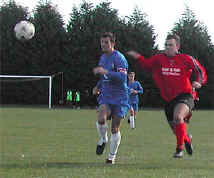 The loss of John Ward had the gaffer reorganising his defence. Lochee continued to mop up the midfield and giving away few opportunities. On 30 minutes a 22 yard effort from Lochee midfielder Callum Hardie beat the diving Fitzpatrick going low into the keepers left hand corner. Five minutes remaining in the first half and Port had a late flourish with some threatening crosses from the right forcing Lochee keeper Brown of his line to meet the challenge. Second period and Port were off to a flyer with a Gareth Dailly free kick searching out the Lochee goal dipping to the back post but keeper Brown stretched back and tipped it over for a corner. Next up Barry McNaughton in full flow down the right cutting inside the area releasing a screaming right footer which scraped the crossbar on its way over. 60 minutes and a through ball to Ben Honeyman running in on goal 25 yards out was met by the striker who spotted the quickly advancing keeper Brown. Brown got a touch but the ball broke right leaving Ben a side foot into the gaping goal. 1-2 and Port looked like they could salvage something from the match but Lochee had other ideas. Again taking control in the middle and solid at the back Lochee were starting to make headway on the Port goalmouth with a few scrambles ending with a golden opportunity to wrap up the points but the Lochee striker tried to place his shot with a side foot effort rolling past the left upright. Port tried hard to make some headway into the Lochee goal area being denied by a spirited defence. With 5 minutes left Lochee made sure the three points were heading across the Tay when Craig Robertson rounded keeper Fitzpatrick. Tayport - F Fitzpatrick, G Paterson, J Ward, D Wemyss, B Craik, S Stewart, S Christie, R Morris, B McNaughton, G Dailly, B Honeyman. Subs used K Heenan & J Elliot.